Franklin Catchment Evans Track- 57.334N 43.950E Aboriginal scar tree registered on the Aboriginal site register in 1998. Protected under State and Federal legislation. This site was clear-felled and burnt in 1997. All rainforest buffers were removed increasing the risk of wildfire and introducing increased levels of Myrtle wilt, fatal to all infected Myrtle beech trees. Wildfire and myrtle wilt are the two most serious threats to Victoria's Cool temperate Rainforests. 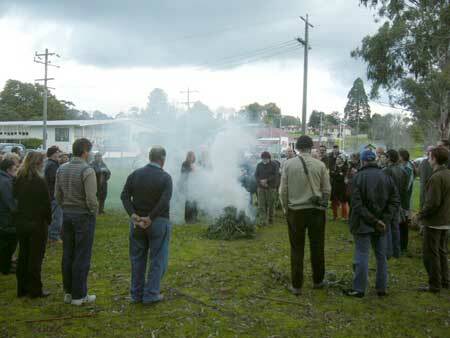 July 27 2008 Boolara Gippsland: Gunai 'Welcome to Country Ceremony' conducted by Gunai spokesperson Robbie Thorpe. Robbie urged people to keep on pressuring Hancock who operate on about 80,000 hectares of Gunai land. Where is Hancock's permission from Aboriginal people to log these areas? 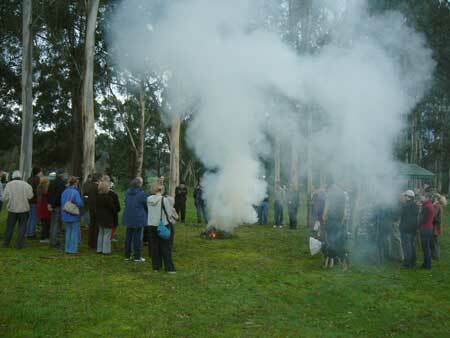 Boolara Gippsland: Sunday July 27 2008: Local community and Strzelecki forest campaigners receive Aboriginal 'Welcome to Country' by Robbie Thorpe (Gunai Nation). 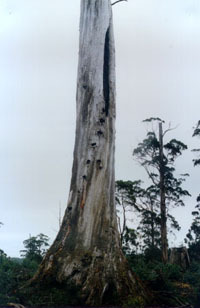 At the ceremony Robbie questioned the legal validity and jurisdiction of Hancock's logging operations in Gunai country (Gippsland). (taken from Native Forest Network Australian Forest Conference Papers - October 1994). What I'd like to talk about is the relationship to the land Aboriginal people have, and how the destruction of our land also represents the destruction of Aboriginal people. That can be seen right across the face of this planet. You even have indigenous people destroying their own lands now, to enable themselves to survive. It's an absolute tragedy that this is happening. Where the land is destroyed, so are the Aboriginal-indigenous people . . . I also see the law as it is today as the single most destructive thing in the Australian environment. What I mean is that the law that we live under in this country is an alien law which was imposed on this country. It was imposed through an invasion. A lot of people say it was settled; it's not true. A fleet of ships came out here captained by an English naval officer, Captain James Cook. Cook's instructions from his king were to get consent from the Aboriginal people. That failed to happen. We all know the story of Terra Nullius. For the people that don't know what Terra Nullius means, it's a latin term meaning empty land. That's how Australia was occupied, the fact that it was a Terra Nullius and that was overturned in 1992 through the Mabo decision (a High Court decision that determined that traditional land rights were not extinguished by the illegal occupation of this country - ed's note). Under the guise of Terra Nullius the British set about committing genocide of the indigenous peoples . . . and also the unbelievable destruction of our lands. If people can imagine what it was like in this country 200 years ago, you don't know what you've missed out on. You don't know anything about what life is all about. The condition this country is in now, probably has one tenth of its beauty left, if I can put it like that. It was an absolutely beautiful country and probably the most important thing, because of the way Aboriginal people looked after the land and because of the way they respected the law of the land, was that we had something to offer our children and that was a future. That was the driving force behind our conservation. We were always going to be here in this country. We were a part of the creation. A part of this country just like any other of the animals that are here, the flora and fauna. Aboriginal people are a crucial element in that ecology. The crucial element. My fears are when that crucial element is finally destroyed, which it looks like it's going to be, particulary in the areas of southern Australia where there's been no recognition under white mans law, the land will suffer as a result. You've got to remember that the indigenous people have a spiritual relationship to the land. It's vitally important. The white man must have been spiritual at some stage of his history, but over the generations of being dehumanised and dispossessed from their own lands they've lost the connection to the land. This is the key for survival of the planet. Australia can't stand another 200 years of ignorance. It won't last that long. Australia was the last continent to be colonised. The technologies that they brought to this country have destroyed the country in an unbelievably short space of time and it was a very delicate country to begin with . . . I think that some of the most foolish and ignorant people on earth live in Australia and that's reflected by what they've done to the environment. If people only understood how much Aboriginal loved this land and how much a part of it we are. We are the crucial part and if we die so will the land. It's our creation. We know the songs for our country. White fellas don't know them songs. They don't know how to sing the spirit of the land. Who's going to do that? What I'm saying is that to live in this country, you're going to need the Aboriginal people to survive too . . . So unless the law of the land is recognised and Aboriginal people survive, forget about the forest, forget about the trees, forget about all the animals, forget about anything that's native in this country because it won't survive. We are the totem link to those animals. We've got a spiritual link to them. We die, they die. They die, we die and you can see that pattern all around the world. Where there's land being destroyed, so are indigenous people. If you don't live under the law of the land, you're going to destroy that land. Indigenous people belong to those areas. They are like the indigenous flora and fauna. It's just the human element and that's what people don't understand. They don't know where the human element fits into the environment. They know all about the koala bears and the bluegum trees, but they don't know where they fit into the scheme of things. But there's a simple blueprint about where you do fit in. That's in the Aboriginal mode. That's the law of the land. Our people had it worked out to a tee. We had a future there for our children. That's what civilisation means to me. It's very important to understand where you fit into the environment. Do you know anything about the law of the land? Do you know the people's land that you're living on? I'm sure a lot of people wouldn't know. I'm sure alot of people could tell me the names of 5 or 6 Indian tribes in America, but they couldn't tell me 5 here. They couldn't tell me the names of 5 Aboriginal leaders, but they could tell me 5 Indian leaders. It's amazing, because the Aboriginal people are the most studied or researched people on earth and yet the most ignorant people about Aboriginal people on this planet are the Australian people. How do you figure that out? . . .
Read court transcripts about Robbies struggle with the illegal occupying government.